Catalana Occidente is one of Spain’s largest insurance groups, with over 4 million customers and more than 20,000 agents. This major holding group comprises of several subsidiaries: Seguros Catalana Occidente, Seguros Bilbao, Plus Ultra Seguros, Atradius, Atradius Re, Crédito y Caución, NorteHispana, Catoc, Vida, Cosalud, and other complementary entities. 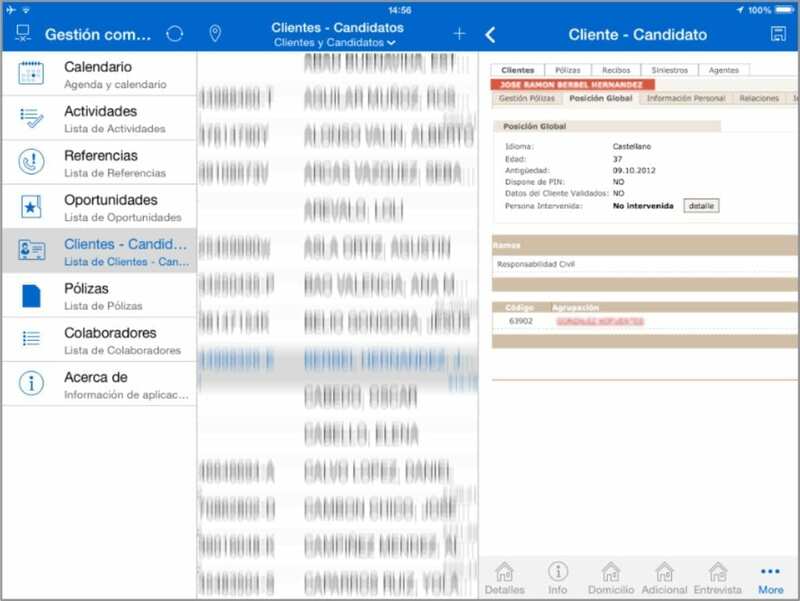 Having a broad product portfolio and a growing number of agents, Catalana Occidente decided to look for a technology solution that would hold all business information, has the possibility of integration with other business tools (such as SharePoint and Outlook) and the data would be available for their insurance agents from anywhere via mobile devices. 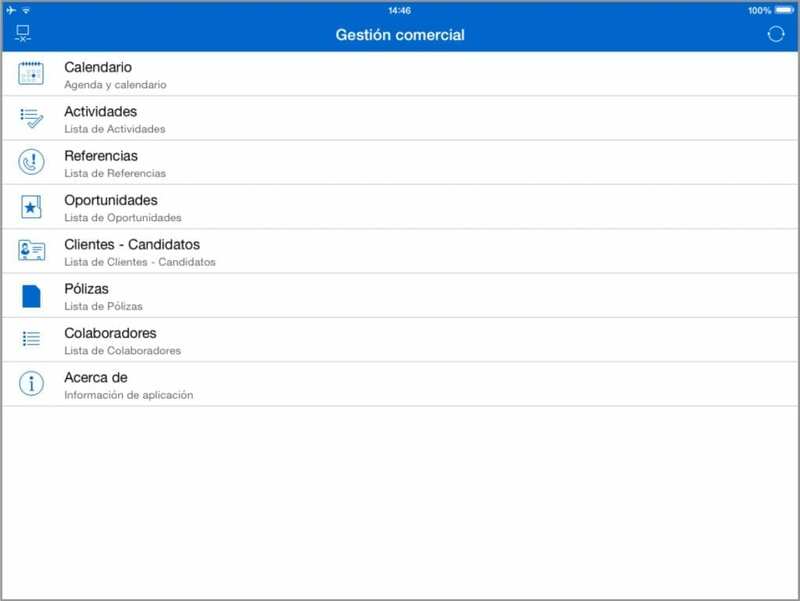 They chose Microsoft Dynamics CRM with Resco Mobile CRM. The solutions were customized to the needs of Grupo Catalana Occidente and implemented by Microsoft and Resco partner Prodware Spain SA. Microsoft Dynamics CRM 2011 is the heart of Catalana Occidente‘s business operations with more than 4,500 users. It holds almost 30 million records; throughout the year they are working with more than 1.2 million active business records, 600,000 open business opportunities and many new activities that are created every day. The insurance group has an extensive external commercial network of agents, visiting customers every day. As the CRM is the source for all the relevant business and customer data for the agents working on the go, they needed a tool for accessing this data and at the same time updating the data from their mobile devices. Offline functionality. “The main objective was the possibility to work in offline mode to allow agents to work without having internet connection,” says Jordi Ribes Preckler, Business Processes Development Manager at Grupo Catalana Occidente. It was a clear choice for Grupo Catalana Occidente as Resco Mobile CRM met all the required criteria. The solution was tailored and implemented with the help of Microsoft and Resco partner Prodware Spain. Currently about 200 sales agents (and rising) use the Resco Mobile CRM application to have up-to-date information from Microsoft Dynamics CRM from any mobile device. The solution was published in the repository of mobile applications so that all Catalana Occidente’s agents of the external commercial network are able to download the application for their convenience. Besides, the agents make use of new personalized entities in their Resco Mobile CRM application. For example, we created a new entity to manage contracts with custom entity relationships. In this case we wouldn’t use the standard entity because they have many relationships with others entities (products, invoices…) that we don’t use. Also we created a new entity to manage commercial teams and reduced some functionalities to make an easy experience for the users. Increased mobility and productivity. With the new mobile CRM tool from Resco, agents are able to have a complete control of their business opportunities — update status, add notes, manage all related tasks and activities with a few clicks in the mobile application. This fast access to sales data and background information helps them in consulting the insurance contracts with their clients in real time. Furthermore, the mobile CRM tool is accessible on any mobile device, so the sales agents can use a variety of different smartphones and tablets running on both, iOS and Android. Professional team. By providing a comprehensive mobile application that can integrate CRM functions into a mobile device, the insurance agents gained a competitive advantage as well as it increased their image of professional salesmen when visiting customers. 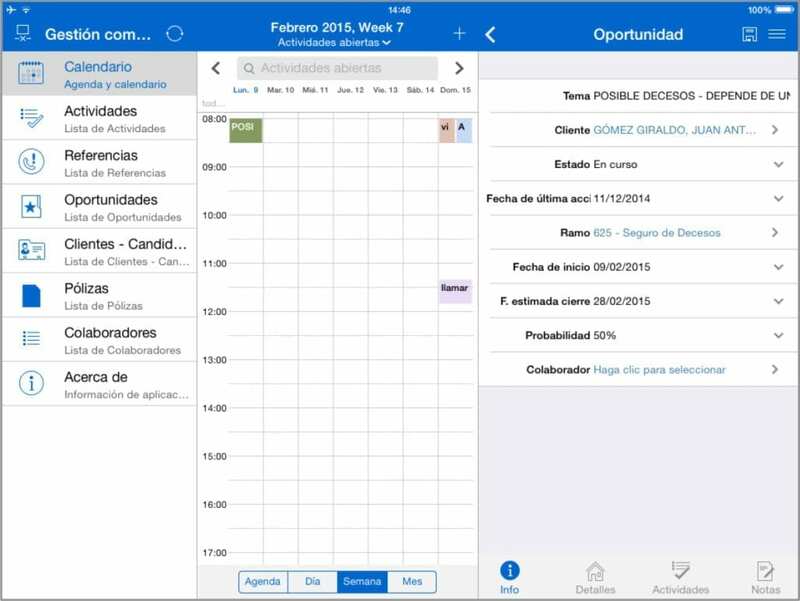 We needed an extra functionality in the calendar that would allow us to show opportunities with its beginning date. Resco support helped us achieve this functionality in the online and offline mode. The Resco Mobile CRM versions are ahead of our ability to implement them! That’s great because it allows us to manage the evolution of the mobility solution.